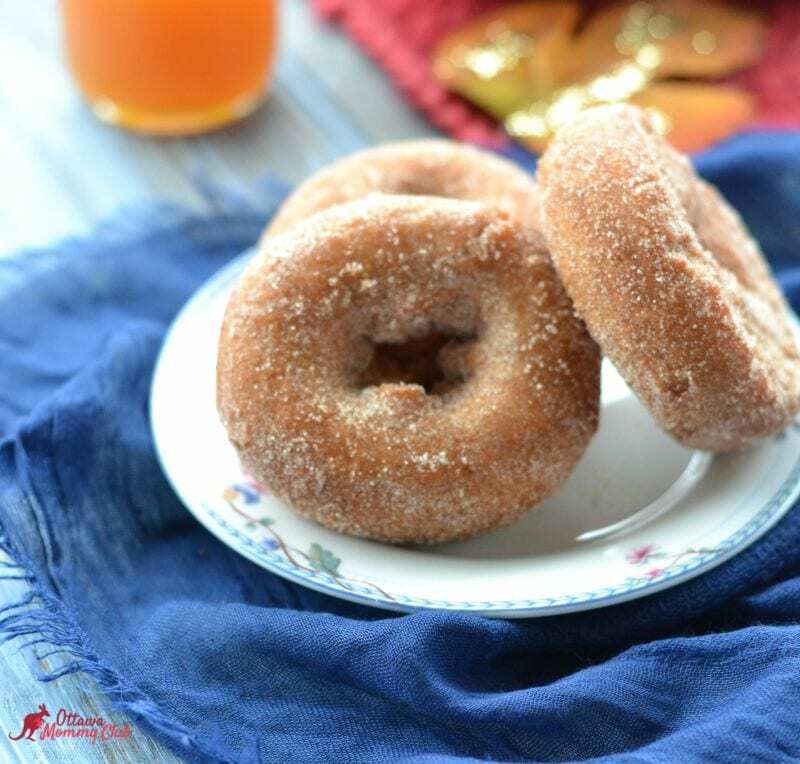 These melt in your mouth Apple Cider Donuts are so moist and delicious that making one batch won’t be enough! The cider adds more flavor while its acidity makes the doughnuts tender. It’s such an easy fall donut recipe to make at home with the kids. 2. Bring cider to a boil over medium heat. Cook, stirring occasionally, about 10 minutes. 3. In a bowl, mix baking powder, salt, 1 cup flour and remaining sugar and cinnamon. In another bowl, whisk butter, eggs, yolk and cooled cider. Add cider mixture to flour mixture; mix until smooth. Add remaining 2 1/2 cups flour and mix. Dough will be sticky. Refrigerate 20 minutes. 4. Pour oil into a large pot and Heat oil over medium-high heat until it reaches 375ºF. 5. Remove dough from fridge and roll out to 1” thick with donut cookie cutters cut out donuts. Makes about 24 Donuts. 6. Carefully place doughnuts into hot oil. After about 1 minute, doughnuts will rise to surface and begin to brown. turn over and fry 1 1/2 minutes longer. Transfer to lined plate to drain. 7. When doughnuts have cooled for 1 minute, add to plate with cinnamon sugar and toss to coat. Line baking sheet with parchment. Line a large plate with paper towels. In a paper bag, combine cup sugar and 1 Tbsp. cinnamon; shake to mix well. Set aside. In a bowl, mix baking powder, salt, 1 cup flour and remaining sugar and cinnamon. In another bowl, whisk butter, eggs, yolk and cooled cider. Add cider mixture to flour mixture; mix until smooth. Add remaining 2 1/2 cups flour and mix. Dough will be sticky. Refrigerate 20 minutes. Remove dough from fridge and roll out to 1” thick with donut cookie cutters cut out donuts. Makes about 24 Donuts. I want these right now!!! I have a donut obsession and how good with these be with a morning coffee especially with the fall weather upon us. Make a batch this weekend! These look like an absolute must try!! Saved to Pinterest for later! This sounds like a yummy fall treat! These sound amazing!! I will definitely be trying this recipe!! This is my dad’s favorite donut. I really love them myself! They sound fabulous – thanks for the recipe! These sound fantastic!! Thanks for this recipe! Would make a great treat! 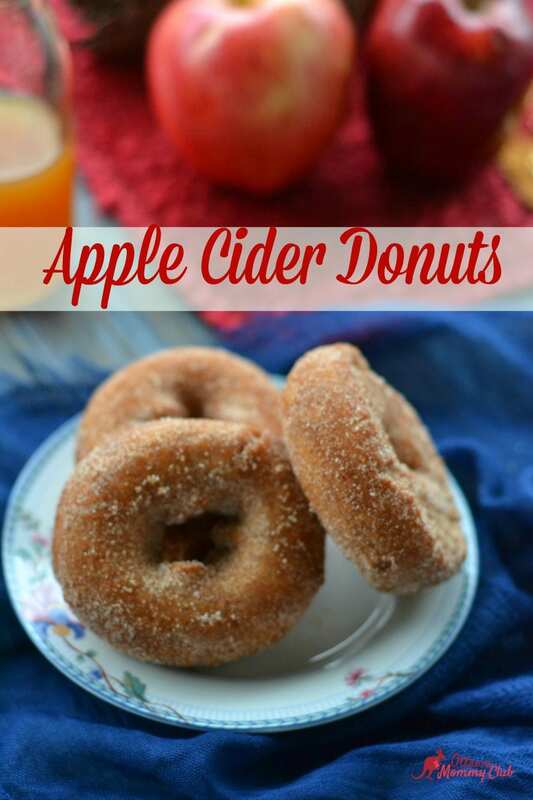 These sound delicious, The apple place here in Norfolk county makes the apple cider donut and they are to die for!! !